Can I Remove Asbestos Shingles on a Wood House? Question: I have an old 1930s home in western Connecticut. It has two layers of siding on it. The first layer is wood shakes, some of which I know are rotten and termite damaged. Over that wood layer is asbestos siding. The pieces are about 20" x 10". Latex paint is peeling off and the whole thing looks like crap. I would like to have both layers removed, down to the sheathing, make the necessary repairs, wrap and side the house with cedar clapboard. When I sell it someday, the word "asbestos" is not going to work in my favor. I've spoken with a number of contractors. They all have a different take on removal of the asbestos. Generally, they say that because the asbestos snaps off cleanly, I don't need to hire an abatement team. Of course, we would dispose of it in a special dumpster. Do you know anything about this? What would you recommend? Your city and county may have different rules, but in my county (which is pretty typical of many other counties), there are no legal requirements pertaining to the removal of asbestos from your home. They only care about the proper disposal of the asbestos. 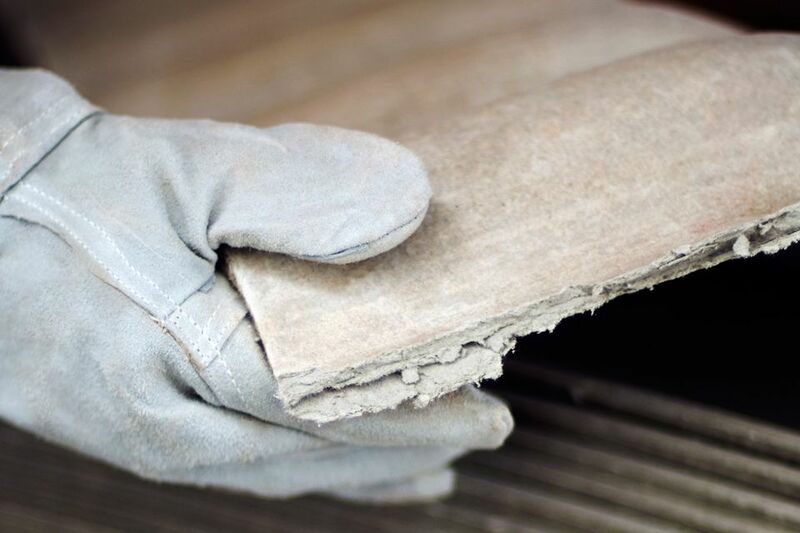 Most dumpster companies don't allow asbestos in regular dumpsters. You mention that you would rent a special dumpster just for asbestos. I would make sure that the hauler is being completely honest with you, and not just telling you that it's an asbestos-friendly dumpster. If they get caught at the landfill improperly disposing of asbestos, the liability may reach back to you. Unfortunately, one indication that the asbestos dumpster may be legal is that it will cost several times more than a regular dumpster. The East Coast is filled with houses sided in these asbestos-cement shingles. If you do somehow end up with those shingles remaining on your house, I doubt they will affect your sale. These shingles are a fact of life in that area and for houses of the early and mid 20th century. I agree that these asbestos-cement shingles can be removed safely--without costly teams of abatement professionals. When you remove those shingles, they will either come off when you pull out the nails, require you to snap them off or require you to cut them. Rarely, if ever, will they need to be cut, and cutting is the one activity that creates the hazardous dust. Many state agencies even publish guidelines to help homeowners safely remove these shingles. Below, I've linked to a set of good, concise, and level-headed instructions from the State of Maine about how to do this. I understand your desire to remove those "garbage" layers and start afresh. Even if you wanted to add on a third layer, this may not be possible. At the very least, you would raise the total thickness of your siding so far out that it reaches door and window casing--not very attractive. It might even extend beyond the casing, which would cancel out the casing's moisture-diverting abilities. So, I think you have not only a good idea but perhaps the only functional idea for your house's siding. ...separate siding removal/disposal and siding installation by hiring different companies. This way, you can assemble your own team of workers to demo the present siding and negotiate a more favorable price. If you're up to it, you can even pull together day laborers and get the job done dirt-cheap. Of course, hiring day laborers does not mean being lax about safety. You'll have to supply all of the demo tools, but these can be purchased for next-to-nothing at Harbor Freight or similar places. More importantly, you would have to supply safety gear for the workers and you would have to be the foreperson, micro-supervising their work. So, it's not money-intensive, but it is time-intensive.